I have nothing against grey hair – on other people. The natural, all-over look - a la Meryl Streep in the Devil Wears Prada - can be fabulously chic, and that faux-granny-grey, sported by Kelly Osbourne and her gang, is lots of fun. I’m less keen on the type of grey that sneaks into my own hair, when I’ve left it too long between salon trips; the type that’s coarse and wiry and sticks out a little strangely and all too prominently against its darker sisters. On me, it just looks messy - and, while I am messy, I’d prefer it not to be so obvious. January is of course the longest and poorest month: ideal, so, for testing out the current crop of root disguisers and salon colour extenders. So while I’m in between pay-days and in between hairdresser visits, here’s what I’ve been using to save my salon colour for longer, and keep the grey at bay. Firstly, Revlon Professional have six shades of this sulphate free 2-in-1 shampoo and conditioner, designed to enhance your colour and keep it from fading as quickly. I use it the Radiant Darks variety for black and dark hair and find it really pleasant – as well as its colour extending properties, it leaves my hair feeling soft and full of moisture. You’ll find it in salons or online; Terrisales have it for €9.99. Next, I love these two products from Color Wow. (Actually, let me rephrase that: I love all the products from Color Wow that I’ve tried to date; each and every one has been awesome.) 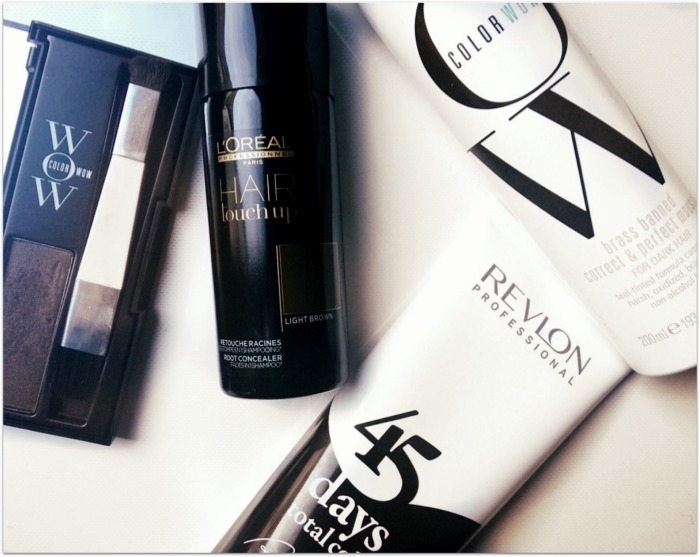 Any brunette that has lightened her hair will know the struggle to keep brassy tones away. Brass Banned is a teal coloured moussed for dark hair that tones down warmth; it also comes in lavender, for blondes. Not only does it work, but it also improves the texture of my hair, fights frizz and makes it easier to style. Another Color Wow favourite is their excellent Root Cover Up powder; just brush it on to temporarily colour over the greys. Not only is this easy to use but the tones look really natural – it comes in seven water (and sweat) resistant shades. I won’t be without it now – look for it in Space NK or buy from ColorWowHair.com. The one downside? It’s pricey enough at €35 - which is why I’m delighted to add L’Oreal’s Hair Touch Up to the mix. This handbag sized can is basically a spray version of the Color Wow product; it comes in 4 shades designed to disguise greys in a natural way, and washes out with your next shampoo. At €14.95 for 75 ml it’s also wallet friendly – although it won’t last as long as the Color Wow kit. Do you have any more colour extending tips or tools in your beauty kit? Share them in the comments!